The weather here in Jasper National Park has been playing games with us — extreme downpour for a few hours and then less than an hour of dissipation or sunlight. Although the breaks from the rain are great, it alters the playing field in the insect collecting game we play. Instead of expecting great plunders in our malaise traps, we can generally find that we do not catch as many insects in them. Our pan, pit fall, and intercept traps regularly get “rained out” and like the malaise, our catches are not so great. With all of this rain we depend a lot more on hand collection where we are actively seeking out where insects are hiding. Overturning logs, looking under rocks, sifting through detritus and searching on trees. Today while doing our regular search the sun appeared and the insect life that had been hiding came out for a quick reprieve. I was lucky enough to come across a Goldenrod spider nearly perfectly blending in on a dandelion. It had it four forelegs extended, which I presume were to be used for an ambush, although the legs greatly resembled the petals of the dandelion. I was so fascinated with the camouflage of the spider that I extended my research through resources that we have on the bus. The Goldenrod spider (Misumena vatia) has yellow and white colourations that it can slowly morph between to best blend in with its surroundings. As many know, camouflage is not an uncommon trait in the animal kingdom, but it was not until we started our rain-adapted insect collection that I realized just how common it was. I have mostly come across the camouflage in spiders such as the Goldenrod, Wolf and other ones I wasn’t able to identify, although camouflage is apparent in all orders of insects. Unfortunately, I have not had the opportunity to take a picture of the hidden insects, although, if you would like to see their disguises for your self, try doing an online image search of Goldenrod spiders or wolf spiders, or just camouflaged bugs and you can see the amazing characteristics of these insects. Today we chose to do some hand collecting at a place called Talbot Lake, in Jasper National Park. It was a rare sunny day in the Rockies and we took our nets and swept the dunes around the lake. It was a successful day, plenty of bright indigo damselflies and helicopter damselflies chasing each other on the shores of the lake. My accomplishment of the day was snatching one out of the air with my bare hand! There were also many hover flies (Family: Syrphidae) showing off their expert flying maneuvering around the lakeside vegetation. As their common name eludes, these flies can hover perfectly still during flight, making them tricky to collect because they will often disappear against a complex background of leaves. 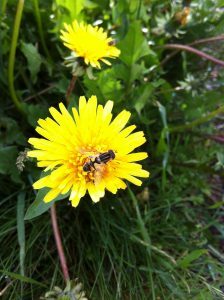 Another common name given to them are flower flies because they are pollinators. Some are very convincing mimics of hymenopterans, often with yellow and black banding on their abdomens to trick predators into thinking that they can deliver a painful sting. This is known as Batesian mimicry, and I find it to be particularly fascinating, especially when it is so convincing that it can fool most (except entomologists) at a glance. After we were satisfied with our catches, we decided to hike to the top of a steep hill overlooking the lake. When we arrived at the top, we were awe-struck by the spectacular view of the lake and mountains below. Despite our sore legs, it was an epic end to a long day in the field.